Just because it's summer doesn't mean I'll stop wearing black. I WILL NEVER, you can't make me. 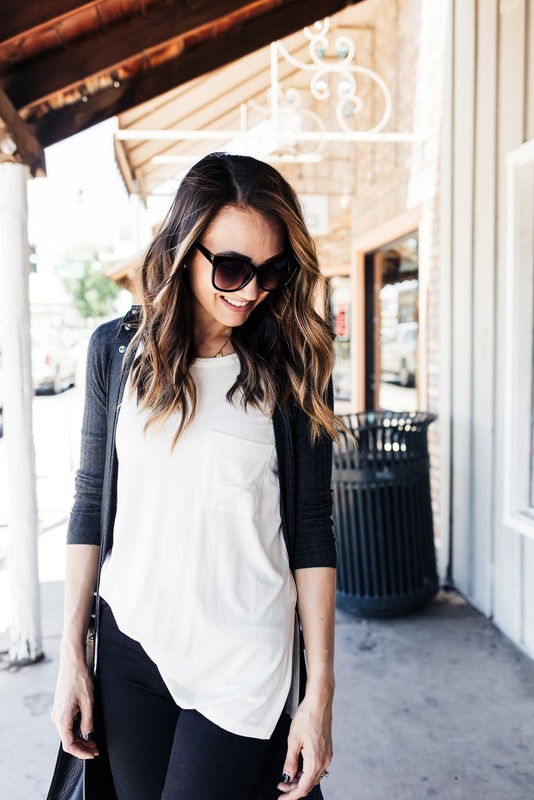 Although we don't really get them in Arizona, I love those perfect summer evenings where it cools off just enough for jeans and a light sweater. We'll definitely be getting a few of them in Milwaukee! Love them! I love a plain white tee, and THIS tank is no exception. I'm all about basics that can be easily mixed and matched. It's perfect under a long cardi in the evening, or with some distressed jean shorts and a cute pair of sandals and sunnies! It's long and has super cute side splits, making it perfect for my always half-tucked look. Use code: KAYCEE15 for 15% off your order!